One of the most enjoyable projects I finished so far this year is this hot sauce bottle. Although I completed it last month (February), I actually started it a year ago, worked on it in my spare time, put it aside for a while, then rescued it from out of the closet for its final resurrection. The wooden container itself is made of a gourd which was cleaned out and cut near the stem for a pouring mouth. I beaded a chile motif for the front, then sewed the completed beaded mosaic onto a leather wrap. 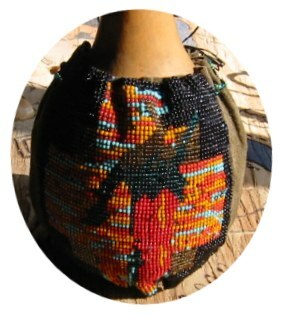 Then the wrap was sewn around the gourd itself. I used what's called a square stitch to make the beaded portion more picture like and very square. I like the finished results quite a bit. 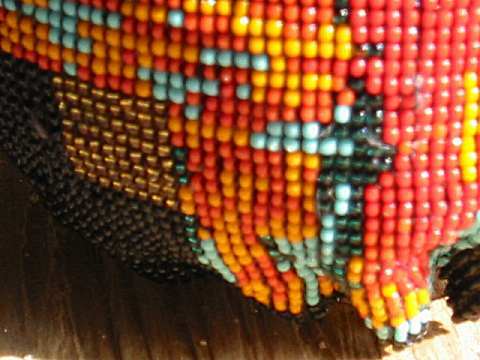 Here's a close-up view of some of the beading. As you can see, I had to add or drop beads in the right spot to get the look I wanted. As some of you know, I make drums out of gourds. Here is a beater I dressed up in beads. 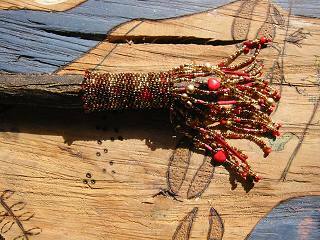 The handle beaded portion is approx three inches long, not including fringe. There are two red cross depictions on front and back. 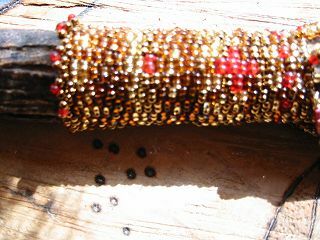 The beads are mostly 11/0 Chechs with some copper and gold and glass and wooden beads in the mix. I even found some darling red glass hearts to add to the fringe. This was done in double bead Peyote (gourd) stitch. The beater portion is from cowhide. The bells are simple brass bells from the craft store. More beaded fun in 2002. 2001 Gourd Art Gallery by Kasin Hunter?